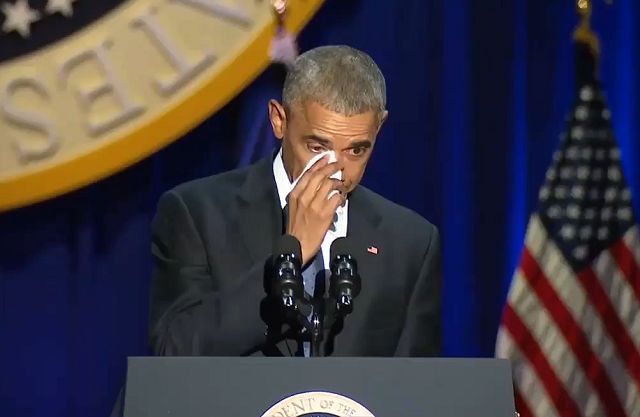 Often pushing back tears, President Barack Obama delivered his farewell speech at 9 p.m. EST on Tuesday in his hometown of Chicago, Illinois. It's good to be home. My fellow Americans, Michelle and I have been so touched by all the well-wishes we've received over the past few weeks. But tonight it's my turn to say thanks. Whether we've seen eye-to-eye or rarely agreed at all, my conversations with you, the American people -- in living rooms and schools; at farms and on factory floors; at diners and on distant outposts -- are what have kept me honest, kept me inspired, and kept me going. Every day, I learned from you. You made me a better President, and you made me a better man. I first came to Chicago when I was in my early twenties, still trying to figure out who I was; still searching for a purpose to my life. It was in neighborhoods not far from here where I began working with church groups in the shadows of closed steel mills. It was on these streets where I witnessed the power of faith, and the quiet dignity of working people in the face of struggle and loss. This is where I learned that change only happens when ordinary people get involved, get engaged, and come together to demand it. After eight years as your President, I still believe that. And it's not just my belief. It's the beating heart of our American idea -- our bold experiment in self-government. It's the conviction that we are all created equal, endowed by our Creator with certain unalienable rights, among them life, liberty, and the pursuit of happiness. It's the insistence that these rights, while self-evident, have never been self-executing; that We, the People, through the instrument of our democracy, can form a more perfect union. This is the great gift our Founders gave us. The freedom to chase our individual dreams through our sweat, toil, and imagination -- and the imperative to strive together as well, to achieve a greater good. For 240 years, our nation's call to citizenship has given work and purpose to each new generation. It's what led patriots to choose republic over tyranny, pioneers to trek west, slaves to brave that makeshift railroad to freedom. It's what pulled immigrants and refugees across oceans and the Rio Grande, pushed women to reach for the ballot, powered workers to organize. It's why GIs gave their lives at Omaha Beach and Iwo Jima; Iraq and Afghanistan -- and why men and women from Selma to Stonewall were prepared to give theirs as well. So that's what we mean when we say America is exceptional. Not that our nation has been flawless from the start, but that we have shown the capacity to change, and make life better for those who follow. If I had told you eight years ago that America would reverse a great recession, reboot our auto industry, and unleash the longest stretch of job creation in our history...if I had told you that we would open up a new chapter with the Cuban people, shut down Iran's nuclear weapons program without firing a shot, and take out the mastermind of 9/11...if I had told you that we would win marriage equality, and secure the right to health insurance for another 20 million of our fellow citizens -- you might have said our sights were set a little too high. But that's what we did. That's what you did. You were the change. You answered people's hopes, and because of you, by almost every measure, America is a better, stronger place than it was when we started. In ten days, the world will witness a hallmark of our democracy: the peaceful transfer of power from one freely-elected president to the next. I committed to President-Elect Trump that my administration would ensure the smoothest possible transition, just as President Bush did for me. Because it's up to all of us to make sure our government can help us meet the many challenges we still face. We have what we need to do so. After all, we remain the wealthiest, most powerful, and most respected nation on Earth. Our youth and drive, our diversity and openness, our boundless capacity for risk and reinvention mean that the future should be ours. But that potential will be realized only if our democracy works. Only if our politics reflects the decency of the our people. Only if all of us, regardless of our party affiliation or particular interest, help restore the sense of common purpose that we so badly need right now. That's what I want to focus on tonight -- the state of our democracy. Understand, democracy does not require uniformity. Our founders quarreled and compromised, and expected us to do the same. But they knew that democracy does require a basic sense of solidarity -- the idea that for all our outward differences, we are all in this together; that we rise or fall as one. There have been moments throughout our history that threatened to rupture that solidarity. The beginning of this century has been one of those times. A shrinking world, growing inequality; demographic change and the specter of terrorism -- these forces haven't just tested our security and prosperity, but our democracy as well. And how we meet these challenges to our democracy will determine our ability to educate our kids, and create good jobs, and protect our homeland. In other words, it will determine our future. Our democracy won't work without a sense that everyone has economic opportunity. Today, the economy is growing again; wages, incomes, home values, and retirement accounts are rising again; poverty is falling again. The wealthy are paying a fairer share of taxes even as the stock market shatters records. The unemployment rate is near a ten-year low. The uninsured rate has never, ever been lower. Health care costs are rising at the slowest rate in fifty years. And if anyone can put together a plan that is demonstrably better than the improvements we've made to our health care system -- that covers as many people at less cost -- I will publicly support it. That, after all, is why we serve -- to make people's lives better, not worse. But for all the real progress we've made, we know it's not enough. Our economy doesn't work as well or grow as fast when a few prosper at the expense of a growing middle class. But stark inequality is also corrosive to our democratic principles. While the top one percent has amassed a bigger share of wealth and income, too many families, in inner cities and rural counties, have been left behind -- the laid-off factory worker; the waitress and health care worker who struggle to pay the bills -- convinced that the game is fixed against them, that their government only serves the interests of the powerful -- a recipe for more cynicism and polarization in our politics. There are no quick fixes to this long-term trend. I agree that our trade should be fair and not just free. But the next wave of economic dislocation won't come from overseas. It will come from the relentless pace of automation that makes many good, middle-class jobs obsolete. And so we must forge a new social compact -- to guarantee all our kids the education they need; to give workers the power to unionize for better wages; to update the social safety net to reflect the way we live now and make more reforms to the tax code so corporations and individuals who reap the most from the new economy don't avoid their obligations to the country that's made their success possible. We can argue about how to best achieve these goals. But we can't be complacent about the goals themselves. For if we don't create opportunity for all people, the disaffection and division that has stalled our progress will only sharpen in years to come. There's a second threat to our democracy -- one as old as our nation itself. After my election, there was talk of a post-racial America. Such a vision, however well-intended, was never realistic. For race remains a potent and often divisive force in our society. I've lived long enough to know that race relations are better than they were ten, or twenty, or thirty years ago -- you can see it not just in statistics, but in the attitudes of young Americans across the political spectrum. But we're not where we need to be. All of us have more work to do. After all, if every economic issue is framed as a struggle between a hardworking white middle class and undeserving minorities, then workers of all shades will be left fighting for scraps while the wealthy withdraw further into their private enclaves. If we decline to invest in the children of immigrants, just because they don't look like us, we diminish the prospects of our own children -- because those brown kids will represent a larger share of America's workforce. And our economy doesn't have to be a zero-sum game. Last year, incomes rose for all races, all age groups, for men and for women. Going forward, we must uphold laws against discrimination -- in hiring, in housing, in education and the criminal justice system. That's what our Constitution and highest ideals require. But laws alone won't be enough. Hearts must change. If our democracy is to work in this increasingly diverse nation, each one of us must try to heed the advice of one of the great characters in American fiction, Atticus Finch, who said "You never really understand a person until you consider things from his point of view...until you climb into his skin and walk around in it." For blacks and other minorities, it means tying our own struggles for justice to the challenges that a lot of people in this country face -- the refugee, the immigrant, the rural poor, the transgender American, and also the middle-aged white man who from the outside may seem like he's got all the advantages, but who's seen his world upended by economic, cultural, and technological change. For white Americans, it means acknowledging that the effects of slavery and Jim Crow didn't suddenly vanish in the '60s; that when minority groups voice discontent, they're not just engaging in reverse racism or practicing political correctness; that when they wage peaceful protest, they're not demanding special treatment, but the equal treatment our Founders promised. For native-born Americans, it means reminding ourselves that the stereotypes about immigrants today were said, almost word for word, about the Irish, Italians, and Poles. America wasn't weakened by the presence of these newcomers; they embraced this nation's creed, and it was strengthened. So regardless of the station we occupy; we have to try harder; to start with the premise that each of our fellow citizens loves this country just as much as we do; that they value hard work and family like we do; that their children are just as curious and hopeful and worthy of love as our own. None of this is easy. For too many of us, it's become safer to retreat into our own bubbles, whether in our neighborhoods or college campuses or places of worship or our social media feeds, surrounded by people who look like us and share the same political outlook and never challenge our assumptions. The rise of naked partisanship, increasing economic and regional stratification, the splintering of our media into a channel for every taste -- all this makes this great sorting seem natural, even inevitable. And increasingly, we become so secure in our bubbles that we accept only information, whether true or not, that fits our opinions, instead of basing our opinions on the evidence that's out there. This trend represents a third threat to our democracy. Politics is a battle of ideas; in the course of a healthy debate, we'll prioritize different goals, and the different means of reaching them. But without some common baseline of facts; without a willingness to admit new information, and concede that your opponent is making a fair point, and that science and reason matter, we'll keep talking past each other, making common ground and compromise impossible. Isn't that part of what makes politics so dispiriting? How can elected officials rage about deficits when we propose to spend money on preschool for kids, but not when we're cutting taxes for corporations? How do we excuse ethical lapses in our own party, but pounce when the other party does the same thing? It's not just dishonest, this selective sorting of the facts; it's self-defeating. Because as my mother used to tell me, reality has a way of catching up with you. Take the challenge of climate change. In just eight years, we've halved our dependence on foreign oil, doubled our renewable energy, and led the world to an agreement that has the promise to save this planet. But without bolder action, our children won't have time to debate the existence of climate change; they'll be busy dealing with its effects: environmental disasters, economic disruptions, and waves of climate refugees seeking sanctuary. Now, we can and should argue about the best approach to the problem. But to simply deny the problem not only betrays future generations; it betrays the essential spirit of innovation and practical problem-solving that guided our Founders. It's that spirit, born of the Enlightenment, that made us an economic powerhouse -- the spirit that took flight at Kitty Hawk and Cape Canaveral; the spirit that that cures disease and put a computer in every pocket. It's that spirit -- a faith in reason, and enterprise, and the primacy of right over might, that allowed us to resist the lure of fascism and tyranny during the Great Depression, and build a post-World War II order with other democracies, an order based not just on military power or national affiliations but on principles -- the rule of law, human rights, freedoms of religion, speech, assembly, and an independent press. That order is now being challenged -- first by violent fanatics who claim to speak for Islam; more recently by autocrats in foreign capitals who see free markets, open democracies, and civil society itself as a threat to their power. The peril each poses to our democracy is more far-reaching than a car bomb or a missile. It represents the fear of change; the fear of people who look or speak or pray differently; a contempt for the rule of law that holds leaders accountable; an intolerance of dissent and free thought; a belief that the sword or the gun or the bomb or propaganda machine is the ultimate arbiter of what's true and what's right. Because of the extraordinary courage of our men and women in uniform, and the intelligence officers, law enforcement, and diplomats who support them, no foreign terrorist organization has successfully planned and executed an attack on our homeland these past eight years; and although Boston and Orlando remind us of how dangerous radicalization can be, our law enforcement agencies are more effective and vigilant than ever. We've taken out tens of thousands of terrorists -- including Osama bin Laden. The global coalition we're leading against ISIL has taken out their leaders, and taken away about half their territory. ISIL will be destroyed, and no one who threatens America will ever be safe. To all who serve, it has been the honor of my lifetime to be your Commander-in-Chief. But protecting our way of life requires more than our military. Democracy can buckle when we give in to fear. So just as we, as citizens, must remain vigilant against external aggression, we must guard against a weakening of the values that make us who we are. That's why, for the past eight years, I've worked to put the fight against terrorism on a firm legal footing. That's why we've ended torture, worked to close Gitmo, and reform our laws governing surveillance to protect privacy and civil liberties. That's why I reject discrimination against Muslim Americans. That's why we cannot withdraw from global fights -- to expand democracy, and human rights, women's rights, and LGBT rights -- no matter how imperfect our efforts, no matter how expedient ignoring such values may seem. For the fight against extremism and intolerance and sectarianism are of a piece with the fight against authoritarianism and nationalist aggression. If the scope of freedom and respect for the rule of law shrinks around the world, the likelihood of war within and between nations increases, and our own freedoms will eventually be threatened. So let's be vigilant, but not afraid. ISIL will try to kill innocent people. But they cannot defeat America unless we betray our Constitution and our principles in the fight. Rivals like Russia or China cannot match our influence around the world -- unless we give up what we stand for, and turn ourselves into just another big country that bullies smaller neighbors. Which brings me to my final point -- our democracy is threatened whenever we take it for granted. All of us, regardless of party, should throw ourselves into the task of rebuilding our democratic institutions. When voting rates are some of the lowest among advanced democracies, we should make it easier, not harder, to vote. When trust in our institutions is low, we should reduce the corrosive influence of money in our politics, and insist on the principles of transparency and ethics in public service. When Congress is dysfunctional, we should draw our districts to encourage politicians to cater to common sense and not rigid extremes. Our Constitution is a remarkable, beautiful gift. But it's really just a piece of parchment. It has no power on its own. We, the people, give it power -- with our participation, and the choices we make. Whether or not we stand up for our freedoms. Whether or not we respect and enforce the rule of law. America is no fragile thing. But the gains of our long journey to freedom are not assured. In his own farewell address, George Washington wrote that self-government is the underpinning of our safety, prosperity, and liberty, but "from different causes and from different quarters much pains will be taken...to weaken in your minds the conviction of this truth;" that we should preserve it with "jealous anxiety;" that we should reject "the first dawning of every attempt to alienate any portion of our country from the rest or to enfeeble the sacred ties" that make us one. We weaken those ties when we allow our political dialogue to become so corrosive that people of good character are turned off from public service; so coarse with rancor that Americans with whom we disagree are not just misguided, but somehow malevolent. We weaken those ties when we define some of us as more American than others; when we write off the whole system as inevitably corrupt, and blame the leaders we elect without examining our own role in electing them. It falls to each of us to be those anxious, jealous guardians of our democracy; to embrace the joyous task we've been given to continually try to improve this great nation of ours. Because for all our outward differences, we all share the same proud title: Citizen. Ultimately, that's what our democracy demands. It needs you. Not just when there's an election, not just when your own narrow interest is at stake, but over the full span of a lifetime. If you're tired of arguing with strangers on the internet, try to talk with one in real life. If something needs fixing, lace up your shoes and do some organizing. If you're disappointed by your elected officials, grab a clipboard, get some signatures, and run for office yourself. Show up. Dive in. Persevere. Sometimes you'll win. Sometimes you'll lose. Presuming a reservoir of goodness in others can be a risk, and there will be times when the process disappoints you. But for those of us fortunate enough to have been a part of this work, to see it up close, let me tell you, it can energize and inspire. And more often than not, your faith in America -- and in Americans -- will be confirmed. Mine sure has been. Over the course of these eight years, I've seen the hopeful faces of young graduates and our newest military officers. I've mourned with grieving families searching for answers, and found grace in Charleston church. I've seen our scientists help a paralyzed man regain his sense of touch, and our wounded warriors walk again. I've seen our doctors and volunteers rebuild after earthquakes and stop pandemics in their tracks. I've seen the youngest of children remind us of our obligations to care for refugees, to work in peace, and above all to look out for each other. That faith I placed all those years ago, not far from here, in the power of ordinary Americans to bring about change -- that faith has been rewarded in ways I couldn't possibly have imagined. I hope yours has, too. Some of you here tonight or watching at home were there with us in 2004, in 2008, in 2012 -- and maybe you still can't believe we pulled this whole thing off. You're not the only ones. Michelle -- for the past twenty-five years, you've been not only my wife and mother of my children, but my best friend. You took on a role you didn't ask for and made it your own with grace and grit and style and good humor. You made the White House a place that belongs to everybody. And a new generation sets its sights higher because it has you as a role model. You've made me proud. You've made the country proud. Malia and Sasha, under the strangest of circumstances, you have become two amazing young women, smart and beautiful, but more importantly, kind and thoughtful and full of passion. You wore the burden of years in the spotlight so easily. Of all that I've done in my life, I'm most proud to be your dad. To Joe Biden, the scrappy kid from Scranton who became Delaware's favorite son: you were the first choice I made as a nominee, and the best. Not just because you have been a great Vice President, but because in the bargain, I gained a brother. We love you and Jill like family, and your friendship has been one of the great joys of our life. To my remarkable staff: For eight years -- and for some of you, a whole lot more -- I've drawn from your energy, and tried to reflect back what you displayed every day: heart, and character, and idealism. I've watched you grow up, get married, have kids, and start incredible new journeys of your own. Even when times got tough and frustrating, you never let Washington get the better of you. The only thing that makes me prouder than all the good we've done is the thought of all the remarkable things you'll achieve from here. And to all of you out there -- every organizer who moved to an unfamiliar town and kind family who welcomed them in, every volunteer who knocked on doors, every young person who cast a ballot for the first time, every American who lived and breathed the hard work of change -- you are the best supporters and organizers anyone could hope for, and I will forever be grateful. Because yes, you changed the world. That's why I leave this stage tonight even more optimistic about this country than I was when we started. Because I know our work has not only helped so many Americans; it has inspired so many Americans -- especially so many young people out there -- to believe you can make a difference; to hitch your wagon to something bigger than yourselves. This generation coming up -- unselfish, altruistic, creative, patriotic -- I've seen you in every corner of the country. You believe in a fair, just, inclusive America; you know that constant change has been America's hallmark, something not to fear but to embrace, and you are willing to carry this hard work of democracy forward. You'll soon outnumber any of us, and I believe as a result that the future is in good hands. My fellow Americans, it has been the honor of my life to serve you. I won't stop; in fact, I will be right there with you, as a citizen, for all my days that remain. For now, whether you're young or young at heart, I do have one final ask of you as your President -- the same thing I asked when you took a chance on me eight years ago. I am asking you to believe. Not in my ability to bring about change -- but in yours. Thank you. God bless you. And may God continue to bless the United States of America.